See Ya dolls up for Hot Girl · K-POPPED! When I look at See Ya‘s teaser album pics (above), I’m instantly reminded of Lee Hyori‘s U-Go-Girl (pic below, left) There’s a connection, but more on that later. The See Ya girls will be dropping their 3rd album on Oct 2 and the trio has transformed their image and music. The girls will apparently do away with their trademark medium tempo tracks and instead experiment with electro house beat tracks. Their new music style and powerful vocals are reportedly a winning combination. Candy-coloured set: Is See Ya sweet as candy? The concept for the album is “Dolls” which boasts of kitchsy looks and syrupy colours. Meanwhile, the title track off the album is Hot Girl. Do you see the similarities between Lee Hyori’s U-Go-Girl and See Ya’s upcoming title track? There’s a reason – Cha Eun-taek – the mastermind behind Lee Hyori’s U-Go-Girl teaser images and MV. Mr Cha is also working with See Ya on Hot Girl. I guess after Lee Hyori’s very successful album, the See Ya girls are going with the guy who has the winning formula, no? Here are more teaser pics from Hot Girl. @Johan & See Ya fans: You can get SeeYa Vol 3 Brilliant Change on YesAsia now for USD19.99! Everyone’s going with themes from the past now. 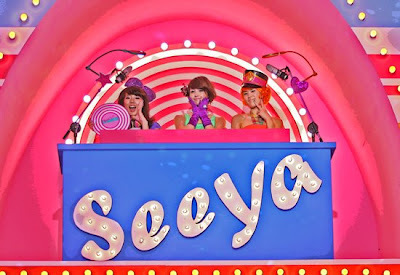 The seeya girls have awesome vocals, but I’ve always found them to be boring. Hopefully they’ll come out with a catchy song! They have really moved to a different concept.Very contrast with their style before. Hyori has always been Korea’s trendsetter! So colourful…reminds me of cotton candy and all that’s nice. I ♥ it! seeing all these bright colors gave me a headache… it is nausea provoking.